It's here. 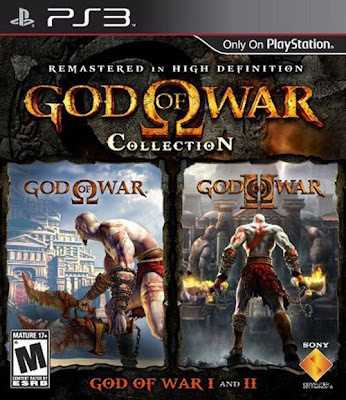 A little too much on the God of War logos, and they could probably have stuck with a piece of artwork that resembles both games. But you have the initial logo - with the "Remastered in High Definition" above it - plus each game's logo on the respective box art for each game, and another, completely unnecessary logo at the bottom. Ladies and gentlemen, I give you the very definition of "overkill." A quick side note: I'm starting to see more and more of the new PS3 logo branding, specifically with the old school PSOne-era sidebar logo, and gone back with the now de facto top bar that has been utilized since - wait for it - the PS2's release.